As I mentioned in my last post, Adam and I picked 17lbs of apples on Sunday. Yeah... I think we might have gone a little apple crazy. Each row we walked up was like "Oh! Look at THIS apple..." and "Yeah, I think we need that apple..." You know how it goes. Anyways, with all of these apples sitting on my kitchen counter I've been search for fun ways to eat them. 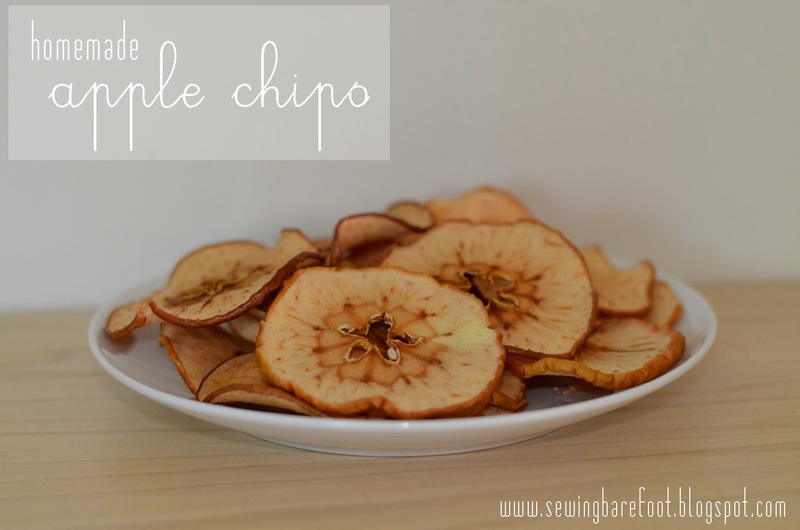 I came across this recipe for apple chips and thought I'd give it a shot. Slice apples into really thin slices (about 1/8"). You can leave the skin on and the core in because it gives them really good texture and makes them look pretty (that's always important). On a cookie sheet prepared with parchment paper, bake your apple slices at 200 degrees for 1 hour. Flip apple slices after an hour and bake for another 1-2 hours (depending on how crispy or soft you want them). Turn off the oven when finished and allow your chips to completely cool. Eating chips can't get much healthier than this! Yum! These look delish!! and much healthier than potato chips! Definitely thrying this one...Pinned!